Fresh Water managing editor Erin O'Brien was on the downtown streets most every day from June 14 until the RNC concluded on June 21. You can read her musings on the efforts of the law enforcement team here and see a number of her social media posts here. In this roundup, however, O'Brien focuses on the protests, large and small. The rumor mill was in full swing weeks ahead of the Republican National Convention. From my neighbors to business owners, locals were certain Cleveland was on the verge of being overtaken by paid professional protesters who would lie down in the streets encased in concrete. Armed gunmen were on their way to threaten law enforcement, while others predicted as many pro-cop groups would be here to counteract them. A perfect storm was headed for Cleveland! I rolled my eyes at each of these assertions and countered with, Yeah? We'll see who shows up. "'We're anticipating a victory dance,' organizer Chris Cox told CNN. 'But it sounds like there's a lot of agitators and a lot of troublemakers coming to town. 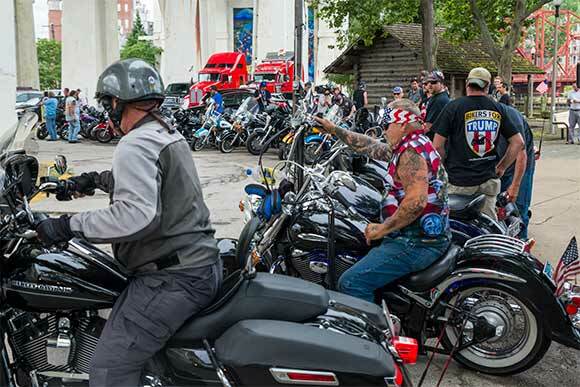 What happens remains to be seen, but you can definitely count on the Bikers for Trump standing with the police department in the event they need it.'" One associated twitter post claimed more than 1,000 members were headed to Cleveland for the RNC. "We're under video blackout 4 safety" (sic) claims the tweet. I shot a video of their arrival in Cleveland that didn't seem to jeopardize anyone's safety. In truth, about 75 Bikers for Trump showed up for the America First rally, which was slated to go until 5 p.m. on July 18. By 4 p.m., however, the bikers were all but gone. For the record, I found no evidence showing law enforcement asked the group for … well … anything. So it went. No armed Black Panthers stared down armed White Nationalists. No walls of human blockades took over the streets. Save for number of tense situations, including one flag burner that caused quite the stir, protests were largely small, disorganized and ineffective. That said, here are my top five takeaways from the RNC protests, all of which surprised me in their own right. 1. All You Need is Love. By far the most successful demonstration of the entire week unfurled on Sunday, June 17, when citizens came from near and far to Circle the City with Love. 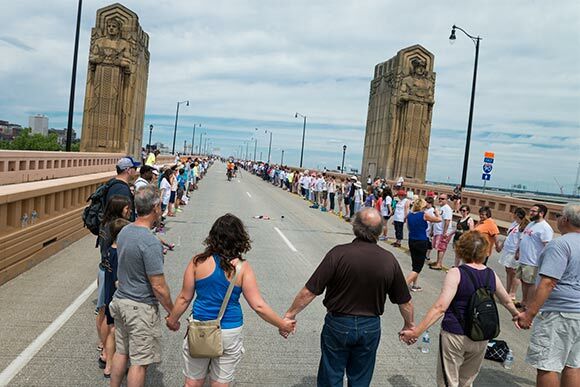 The group joined hands along the perimeter of the mile-long Hope Memorial Bridge and stood in silence for 30 minutes. I arrived at the west end of the bridge just as the event broke up. Smiling people with "Stand for Love" shirts were walking toward me as I headed into the crowd. As the first few dozen passed, I thought: good – they got a turnout. Then the people kept coming and coming and coming. And coming and coming. When I realized their number was well into the hundreds – if not more – my steps slowed; my jaw dropped and my eyes welled at this gentle and remarkable culmination of unconditional good will and humanity. 2. Wall Off Trump Walled Out GOPers. 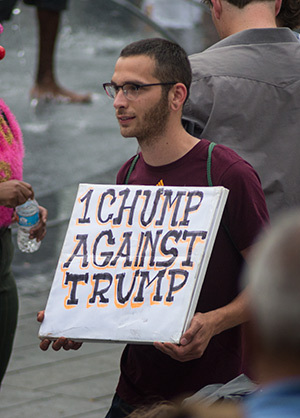 The second most successful protest I witnessed was an effort to "Wall Off Trump," that transpired around midday on July 20. Protesters started from Public Square and marched to a security perimeter entrance at Propect Avenue and East 4th Street. The event featured protesters holding up a fabric brick wall and chanting. It was well organized. Support persons handed out food and drink. I note this protest as it was the only one I witnessed that aimed to impact the event and succeeded in doing so. It effectively shut down the entrance, forcing RNC delegates and attendees heading into the Q to navigate the rowdy crowd and heat en route to the other access point inside Tower City. Some of those members were not amused by the inconvenience. It didn't last long. Cops encircled protesters with their bodies and bikes, not allowing anyone into the area. Spectators inside the "blue wall" eventually got hot, tired or disinterested and left. With no audience, the protest petered out. I witnessed law enforcement using this effective and peaceful technique time and time again over the duration. 3. Ready Thyself to Face the Red Guy with the Trident. The most prevalent and vocal protesters were the religious zealots. They were everywhere, however unrelated. They preached alone on street corners, in small groups with large signs and microphones and via jalopies festooned with warnings about repenting and sinning and Jesus, which they drove around town. one vehicle featured a giant gruesome image with text claiming it to be an aborted fetus. Whether or not the assorted parties had political inclinations is anyone's guess, but they were collectively certain all of us are going to hell. And to those readers who imagine themselves immune, I ask this: got Onan? Their messages were not subtle and all they seemed to accomplish was to incite others. This group was the only one I was able to specifically identify as their website was printed on their sign. 4. No, You Can't Believe Your Own Eyes. One thing I saw play out countless times was how the media distorts what's happening on the ground with visuals. This photo by Bob Perkoski perfectly exemplifies what the media situation was like. It features just two people arguing and an army of photags surrounding them, waiting for the tinder to ignite and getting a shot of the first punch. Furthermore, when two or three protestors started moving along, the dense media parade that ran alongside them was no less than comical. I saw the same phenomenon play out too many times to count, but notably on the Sunday before with those Black Lives Matter protesters in Perk Park. I posted a photo to scale, showing the entire group, but when I watched news reports covering the same event, numbers were conspicuously absent. Visuals were tightly cropped around the small procession. The effect was a grossly inaccurate portrait of what really happened that day. From now on, when I see a tightly framed visual, I'll wonder if the event was smaller – much smaller – than it looks on the screen. 5. The Protests that Weren't. Those hoping to see organized minimum wage workers with $15 AN HOUR signs or a line of environmentalists demanding NO FRACKING before an equally passionate group yelling DRILL BABY DRILL, were plain out of luck. Make no mistake, throughout the RNC, Public Square was a dizzying cacophony of voices and sirens and bongos, but so much of it was one-off protesters holding signs with messages ranging from LOVE THY NEIGHBOR to F--K YOUR BADGE to WELCOME JIMMY DIMORA PUBLIC SQUARE. All week I looked for an effectively communicated and articulate message that shone with authenticity. While heartfelt efforts were myriad, none of them made a profound impact. Except of course for that massive circle of love on the Hope Memorial Bridge. Too bad it didn't remain for the duration of the RNC. Judging from how this city emerged from all it, however, perhaps its karma did. Read a roundup of Erin O'Brien's live social media coverage of the RNC here.